We have an enormous collection of photographic negatives and transparencies on glass and film, going back to the 1870s. They include all sorts of images from studio portraits to holiday snaps, landscapes, photographs of sports teams, and artists’ negatives and transparencies. Many negatives are chemically unstable and, if left in an uncontrolled environment, will deteriorate to the point where you can no longer ‘read’ the image they carry. A very cold environment helps to preserve them – so we keep our negatives in two walk-in cold storage vaults. One vault is kept stable at 2 degrees Celsius and 35% relative humidity. This vault is used to store negatives and transparencies on a film base. The second vault is kept at 13 degrees Celsius and 35% relative humidity, and is used to store negatives on glass plates. 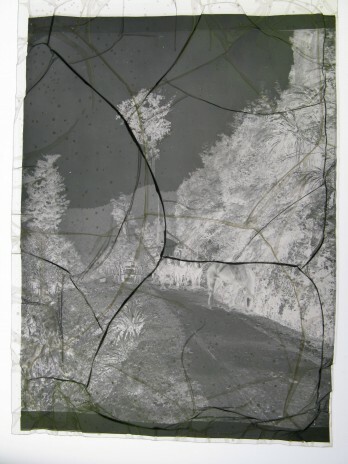 Cellulose acetate film was used for negatives from the 1920s. It tends to break down to acetic acid, causing the film to shrink. This makes the binder layer form channels and spots, and the image becomes difficult to read. Within the cool stores, the negatives are stored in lockable drawers for earthquake protection. 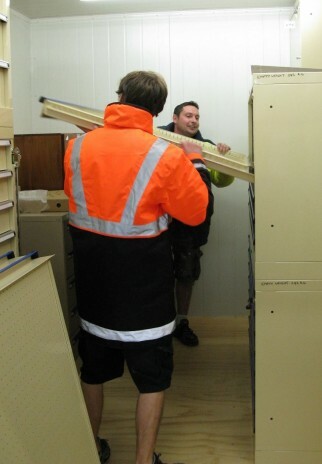 Steve McStay and Paul Simpson slide an empty drawer into the plan chest unit. The existing drawers in our cool store have been filled, so we’ve begun a project to create more storage space. We’ve just finished installing the first group of new drawers, in the film vault. We decided to move the existing cabinets as well as add new ones. In the new layout, the drawers go up to near ceiling height, except where we need to leave space for the cooling or air filtration plant. The drawers are heavy as they’re made of steel and are constructed to take a lot of weight. We enlisted the help of our building-management team to get them into the store. One of the biggest new cabinets is an oversize drawer unit to hold mounted 35mm slides. Our next job is to transfer thousands of slides from a range of cupboards, drawers, and boxes into the new drawers. We also want to store our collection of older colour prints in 2-degree storage because they can fade at room temperature. We’ve included a big set of plan drawers for those. Our next step is to install new drawers and cupboards in the 13-degree vault, where we store glass negatives. Along the way, we’ll do some small but important projects, like making special card folders (called sink mats) for glass plates that came to us broken. We’ll also be photographing over 1,500 glass plate negatives made by Berry & Co, a Wellington photography studio that operated in the 1910s and 1920s, and adding the images to Collections Online. See more about Berry & Co WWI soldiers in our collection. Hi Anita, thanks for the awesome reply. I seem to be doing a few things right especially with the tiff files and back ups. Files are usually around 80mb for 35mm slides and up to 500mb for larger transparencies. I have them backed up on DVD, several copies, plus on 2 hard drives. Another thing I do is make hard copies of images when funds permit, usually 8×12 or there about and keep them in polypropylene enclosures. It’s a slow and costly process. But I think it’s a good idea but have never really seen much about making hard copies as a form of preservation. I have noticed that some older slides have lost some of their colours, blue mostly, so the slide appears red. Do you think it is better to keep slides in glass mounted enclosures or just open to the atmosphere….I live in Auckland and wonder if moisture could accumulate inside a slide mount which has glass. I have around 3000 slides to look after so no where near as many as an institution, just looking for the best way to look after them. Hi again Tim, I think this is more a question for a conservator, as it’s not an issue I’ve come across myself. I recommend you contact the National Preservation Office at the National Library. They advise people on storage and conservation of documents and photographic materials. Here’s a link to their web page: . Good luck! For the average person who doesn’t have cold storage, what is the next best things to preserve slides for as long as possible? Is digital scanning the answer? if you don’t have a cold storage vault, there are a few other options to preserve your slides / negatives, depending on the size of your collection and how much you are willing (or able) to invest. Digitally imaging your slides is one way to go. We photograph our slides/negs in RAW, and save them as TIFF files after colour matching them to the original. We use a scanner to create very large files as ‘preservation masters’, then we create smaller ‘access masters’ as well. The preservation masters are stored on a stand alone server with very limited access, to avoid accidental changes to the files. If you’re working at home, I’d suggest you take high resolution digital images of your slides and save them as TIFFs on a hard drive, and avoid accessing them in case you accidentally change the files. Ideally you should also have a back up hard drive, that you keep somewhere else, in case of fire or theft. It’s useful to have a separate set of the images easily available for quick checks. Digital images are likely to need checking and possibly upgrading every few years, to make sure they can still be ‘read’ by evolving software. You need to link your digital images to the information about the original slide, otherwise you can lose part or all of the image’s meaning. We do this by giving each slide a unique number which is written on the mount, and attached to the digital images. The unique number also attaches to a file where the slide title, place, date and so on are recorded. We have a special museum database for this, but you can use a standard spreadsheet or database. It’s very important to pack the slides correctly, otherwise moisture can condense on the slides, seriously damaging them. You also need to leave them packed up for a while when you take them out of the freezer, so they don’t warm up too fast. The NPS site explains the whole process very well. If cold storage in a domestic freezer isn’t practical, Keep your slides in a cool, dry area in your house or office. Film materials last best at between 30 and 50 % relative humidity, and the cooler the better. Humidity is quite hard to control without 24/7 air conditioning, but at least you should avoid keeping them in a basement area, or in attics which tend to be either quite hot, or poorly insulated.